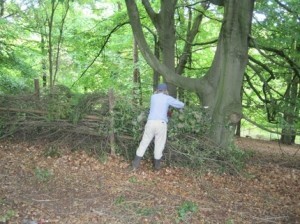 Now we’re comfortably into Autumn, we have a few coppicing tasks lined up. Coppicing tends to produce a lot of different lengths and sizes of wood – being from stout Yorkshire heritage, Chris Skepper would hate all this wood to go to waste, so he has listed his top ten ways of putting coppiced wood to good use! If you would like to try your hand at this woodland management skill, we have coppicing tasks coming up on the 9th November and 21st December at Brasenose Wood and on 7th December at Woodstock Water Meadows. 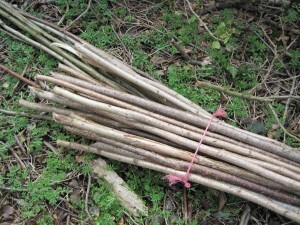 Chris may even set you to work creating hedgelaying stakes and binders! 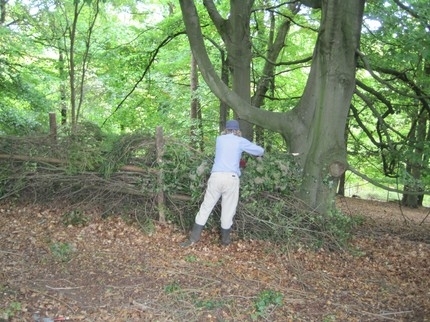 In the past, much of the woodland in the UK was managed by coppicing. This means that it was cut every few years to “harvest” the wood for a range of different purposes. Many different types of wildlife took advantage of this man-made process, including small woodland plants which sprung up in the areas which had been cleared, and the birds and small mammals which took advantage of the scrub for shelter and as a food source. When we do coppicing tasks, we’re usually mainly interested in the benefits for biodiversity, but perhaps we should also try to make use of the material we cut, just as our ancestors would have done. In our region we normally coppice woodland dominated by hazel and ash, perhaps sheltered by big oak standards that we leave untouched. Hazel is flexible wood which grows quickly and can be split and bent easily. Ash is a denser wood that also makes good stakes, and was traditionally used to make tool handles. Hedgelaying stakes are ideally about 5 feet long, very straight, and one to two inches thick. Most expert hedgelayers would use thinner ones, but since we often end up storing them for a long while before they get used, anything too thin would dry out and break too easily. We usually count them into bundles of 10 and tie them up with string. These should be less than an inch thick and at least 8ft long. They are best harvested not too long before they are going to be used because they would get too brittle otherwise, and hazel is best. They don’t need to be perfectly straight although hazel does often grow quite straight anyway. We normally bundle these in 20s, since this makes them a lot easier to handle. We sometimes use these for improving the quality of coppice woodland. 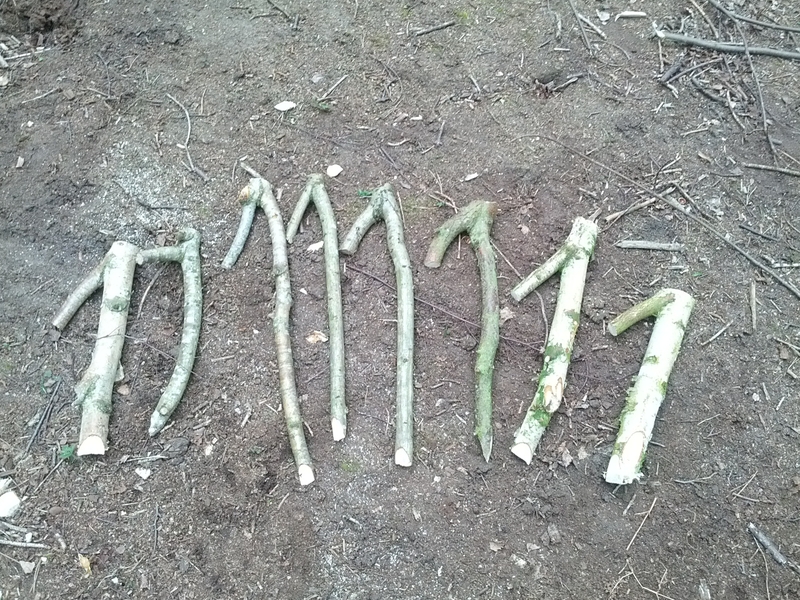 The idea is that you cut part way through a hazel stem and peg it into the ground. 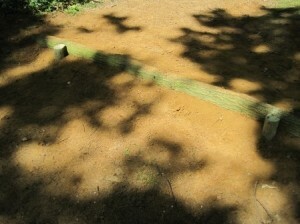 Then, with luck it will start growing and eventually you will have a new coppice stool. More stools means that each one grows straighter so you eventually get a better quality of wood. 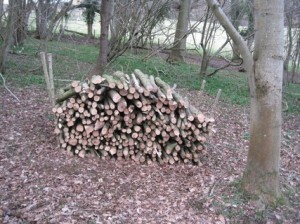 Logs that are 3 inches thick or more usually get stacked up to season. In the past, this would have been prime firewood, of a good thickness that wouldn’t need splitting. In the past the wealthy would have burnt logs like this and the poor would have been left with bundles of brashy material which burned with much more smoke. If no-one claims them for firewood then if they are densely packed the gaps make good homes for invertebrates, which themselves make good food for birds. 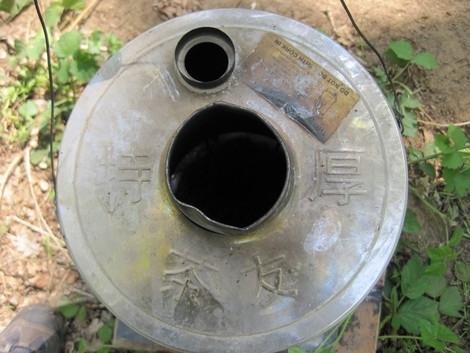 Sometimes you want to keep wildlife or people out of an area of land for a period of time. For example, when woodland has been recently coppiced and you want to try to discourage deer from eating the regrowth. Dead hedges don’t last as long as living ones, but they can be a useful temporary barrier. 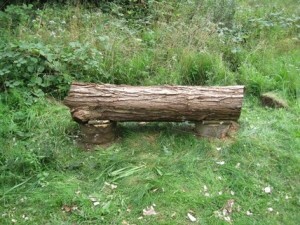 These seats are made from big logs supported at each end by smaller logs which have been dug into the ground. They are then attached with wire and staples or nails. The design could be adapted to make use of whatever size of logs are available, but the thicker the log the longer the seat will last before it rots away. When we started using a storm kettle regularly we found that we couldn’t always find good fuel on all the sites we worked on, for example on a task when we are dry stone walling or fencing in a meadow. 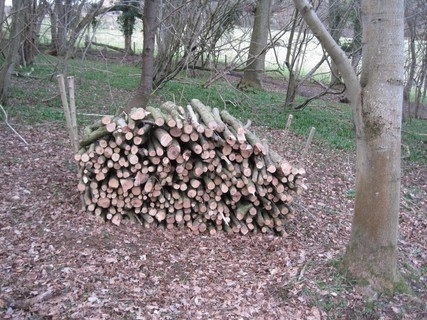 Even if there was dry, dead wood of the right size it still took time to collect and chop up. So we soon realised it was better to bring it with us in a big bag. But when we find a good source we can replenish our supplies. Perfect storm kettle wood is about the same length and thickness as your fingers. 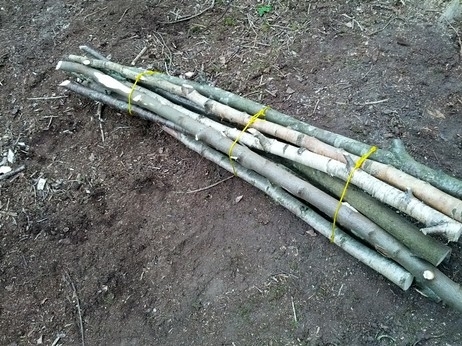 If the twigs are not dead and brittle, then if the bag is left open in tool shed or the van, short sticks will dry out in a few weeks. An otter holt is an artificial version of the natural holes and tangles of tree roots in a river bank that an otter would shelter in. 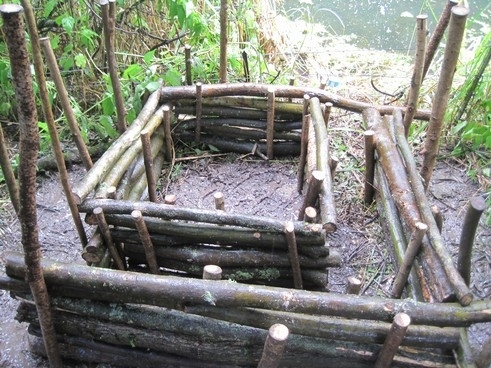 Making an otter holt requires a lot of wood, for the stakes that support the walls, the walls themselves and the roof on the top. After it’s complete, it still needs to be completely covered in a thick layer of scrub so the otters feel they will be safe from predators. It’s surprising how much wood you need to make a single otter holt! And if you want to see how much wood is needed first hand, come along to the resi in Norfolk on 17th – 19th October or the task on 23rd November at Jubilee Fields. These steps are made from logs which were coppiced nearby. Steps like this can help to prevent erosion of footpaths, which can become very muddy and slippy in wet weather otherwise. They won’t last as long as pressure-treated timber, but they are cheaper to make. 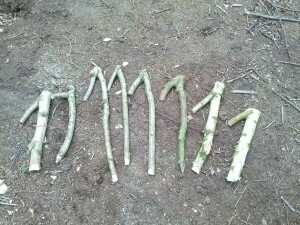 I have used hazel stakes to grow runner beans up in the garden. I have also used them to support an apple tree and some tomato plants. Once you get used to nice hazel stakes in your garden, the canes you get from a garden centre start to look very unnatural and untidy. 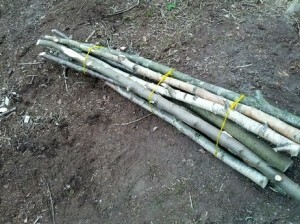 Once, when we coppicing someone asked us to find him a straight 8ft pole to use for a washing line. We’ve also seen people skillfully make rustic looking chairs and tables out of coppiced hazel poles. In the past, all kinds of things would be made from coppiced wood, and if we maintain the demand for good quality coppice materials it should mean more coppice woodland being brought back into active management with the all the benefits that brings for improved biodiversity. I can’t find anyone but the Broads Authority recommends its use. If you can suggest any other suitable woods then I am happy to take advice. I am looking for x140+ poles, up to 100mm Dia, 10ft long, pointed one end, pealed, to be used as vertical piles. Can you point me in the right direction to source such poles? I’m so sorry, I only just found this as it was caught by our spam filter. I’ll ask Chris if he can reply to you.